Cracked Sidewalks: Warrior plates for FIBs? Digressing from Dominic James Mania .. 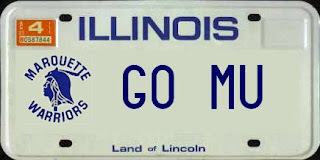 The Illinois Senate approved a bill Wednesday to allow private universities in contiguous states with more than 10,000 alumni in Illinois to request the plates. Money from the specialty plates would go for scholarships for Illinois students who attend those universities. .. "I'd like to hear from the president of DePaul or Loyola what they think about having Marquette license plates running around the streets of Chicagoland," he said. That might be the only good thing about living in Illinois! You can get a UW license plate in Wisconsin, maybe the WI Legislature should get on the stick, and give us some MU plates. I wonder if you're allowed to order Marquette plates with "Warriors" on them? Or "GldEgl Sux?" easy, we Illinois students and alumns run that campus. FIBs run that campus about as much as Rex Grossman runs the Chicago Bears. which is pretty well, I mean he did lead em to the superbowl. What did Brett Favre do this past year? grossman hurt that team more than helped them. that was all Defense. i can think of a dozen other quarterbacks who would have won a superbowl with that team. As an Illinois native who absolutely loved the 8 years I lived in Wisconsin, I get really irritated with all the anti-Illinois hate from Wisconsinites. Yeah, there's a lot of jackasses from Illinois, but Wisconsin has more than its share too. Knock it off with the statism, it's lame.